By the time the Ba.64 had entered service, work had already begun on a more powerful evolution of the system which delivered the prototype for the much improved Ba.65 fighter-bomber. The prototype first flew in September of 1935, went into series production that same year and were essentially copies of the prototype version. The Italian Isotta-Fraschini license-produced the French Gnome-Rhone K-14 engine of 700 horsepower and the early Ba.65 production forms all were fitted with the type. 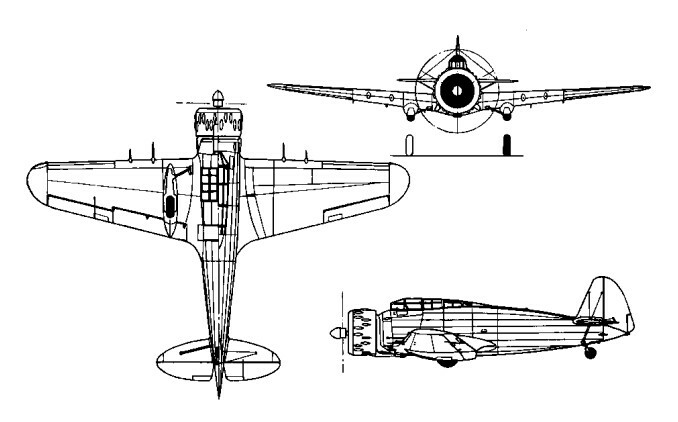 Design of the Breda Ba.65 was the engine in a forward compartment along the airframe with an identifiable oversized cowling. The cockpit was situated directly behind the engine and fitted well forward of the aircraft's center. Wings were of a low-set monoplane design and their bulk fitted ahead of amidships, each wing sporting well-rounded tips. The fuselage was stout in appearance and tapered off gently to become the empennage. The tail was topped with a single, rounded edge vertical tail fin and a pair of high-set horizontal planes, these also well-rounded at their tips. The undercarriage consisted of two main landing gear legs and a tail wheel. Each leg was affixed with a single wheel and the main legs recessed rearwards though only partly under each wing, the wheels half-exposed during flight. The tail wheel unit remained lowered at all times, even during flight. Armament for the Ba.65 was all contained in the wings and was primarily a mix of machine gun systems. These consisted of 2 x 12.7mm Breda-SAFAT heavy machine guns joined by a pairing of 7.7mm Breda-SAFAT general purpose machine guns. For its intended ground attack role, the Ba.65 could be fitted with up to 1,102lbs of conventional drop ordnance. Categorized a ground attack aircraft, the Ba.65 was the only such Italian aircraft to serve in this role during World War 2. 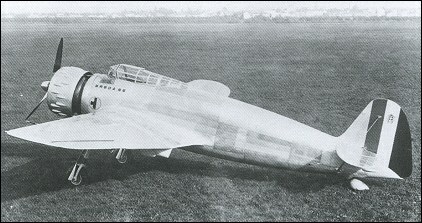 A second series of 137 aircraft was built by Breda (80) and Caproni-Vizzola (57), before production ended in July 1939. They differed from the first production batch by having Fiat A.80 RC.41 18-cylinder, twin row, air-cooled engine was introduced from the 82nd production airframe onwards, driving a three-bladed propeller. The Fiat engine improved output to a relatively impressive 1,000 horsepower. Six Fiat-powered Ba.65s and four more of the Gnome-Rhone-powered version were sent to the Aviazione Legionaria in Spain in 1938. Experience in Spain indicated that the Ba.65 was suited only to the attack role, and the type served with most of the eight squadriglie attached to the two Regia Aeronautica assault stormi (wings), the 5° and 50°. Production of the Ba.65 would last until 1939 to which all were officially retired from 1941 onwards, the aircraft now being wholly outclassed by newer and better breeds of aircraft and limited the Ba.65 to the ground attack role when possible. Following Italy's entry into World War II in June 1940, Ba.65s were involved in the fighting in North Africa against the British. They had a low serviceability rate in desert conditions and the last serviceable aircraft was lost during the British offensive in Cyrenaica in February 1941. Of 218 Ba.65 aircraft completed and delivered for use, exports included 25 Fiat-powered Ba.65 two-seaters to Iraq in 1938, two of them dual-control trainers and the remainder with Breda L turrets; 20 Ba.65s with Piaggio P.XI C. 40 engines to Chile later in the same year, 17 of them single- seaters and three dual-control trainers; and 10 Fiat-powered two-seater Ba.65 bis with Breda L turrets to Portugal in November 1939 (Fiat A.80 RC.41). A single Fiat-powered production aircraft was tested with an American Pratt & Whitney R-1830 engine in June 1937 in anticipation of an order from the Chinese Nationalist government, but this failed to materialize. The Iraqi Ba.65s saw limited action against the British during the 1941 insurrection in that country. Ten were exported to the Soviet Union in 1939. Aviazione Legionairia Ba.65s were a mix of K.14- and A.80-powered types. Spain: 1939, 11 surviving Ba.65s* (of 23) transferred to Ejercito del Aire. But at least some (eg #551) were 'doppio comando' dual-control trainers. The Ba.65 designation was used to signify the definitive single-seat production version while Ba.65bis marked both a two-seat bomber variant and its similar two-seat trainer derivative. Engine: 1 x Fiat A.80RC.41 radial, 1,000 horsepower. 2 x 7.7mm Breda-SAFAT machine guns in wings. Up to 661lbs of internal ordnance in bomb bay and 441lbs of external ordnance held underwing.